The Chamber produces a variety of publications to keep our community engaged while serving our members. Subscribe to future publications to stay in-the-know and browse past publications below. Happy reading! 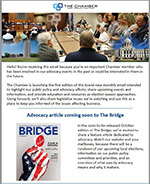 The Bridge is The Chamber’s monthly printed newsletter. 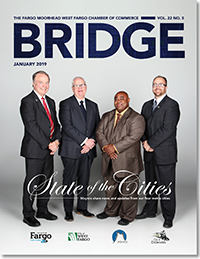 This award-winning publication is delivered by mail the first business day of each month to nearly 3,000 businesses and community leaders, and emailed to over 10,000 more. Submit your news and feedback to us through the link below, or email us at thebridge@fmwfchamber.com. This annual publication is distributed to all Chamber members, as well as local organizations. Chock full of statistics, the Metro Profile highlights all our region has to offer residents, prospects and visitors. 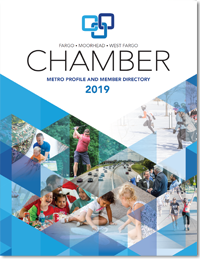 The Member Directory features a listing of all Chamber members, putting your business information at the fingertips of business and community leaders. Copies are distributed to recruiters, visitors and individuals interested in relocating to our region from around the world, Chamber members and local businesses. 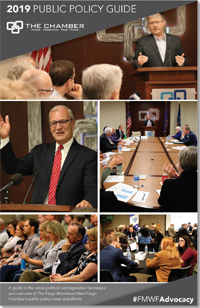 The Chamber’s Public Policy Guide serves as a resource to the issues affecting the metro and a guide to local legislators serving the region. It outlines The Chamber’s stance on various measures and is a must-have guide for all those interested in public policy. Every other year, the Chamber produces a new full color map to reflect Fargo Moorhead West Fargo’s incredible growth and showcase our community as the best to work, shop, live and raise a family. It is distributed to residents, visitors, business prospects and new residents. An interactive version of the map online provides additional exposure for the advertisers. Review The Chamber’s signature events and programs in this guide, and find out the opportunities your business can sponsor and support. Do you or your business make a lot of purchases outside our local community? Many local businesses offer the same products and services at competitive prices and comparable quality. Redirect your dollars by working with local companies and help foster significant growth in the regional economy. Buying local means more jobs, higher salaries, talent attraction and improved community services. They're dollars you are already spending - spend them here! Shop Chamber members first and make an investment in our community. 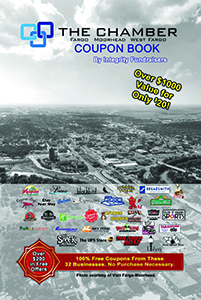 The Chamber Coupon Book is a compilation of valuable specials from a variety of Chamber member organizations. Coupon books cost $20. Contact us to order your copy or be included in the next coupon book! Interested in advertising in any of our Chamber publications? Contact Tracy Meckler at 218.359.0527 or tmeckler@fmwfchamber.com, or download our advertising rate card. Every Monday, the eBridge is received by over 10,000 subscribers and informs its readers about upcoming Chamber events, member news, community information and helpful articles. Sign up to receive the eBridge today! The Chamber’s monthly e-newsletter that highlights our efforts in public policy and advocacy. Get the latest on upcoming events to keep you informed and resources for the issues we’re watching. At the top of each month, this electronic notification lets you know the Chamber's monthly newsletter is ready for download and provides a direct link. It’s everything you need to know to keep on top of the Chamber calendar! Learn what’s coming and how you can take part! The Young Professionals Network monthly e-newsletter serves members of The Chamber’s YPN program, providing event information, resources for YPs, business tips for success and profiles of other YPN members.